It was our impossible dream. 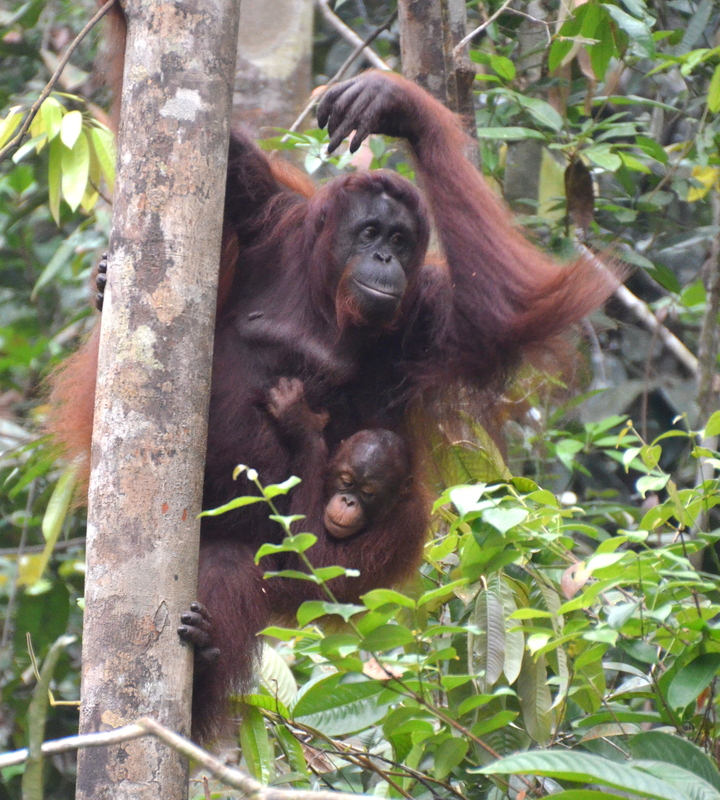 The first attempt at seeing those orange orangutans in the wild in Borneo had to be cancelled due to my medical problems. The second attempt at seeing them was aborted by the ship I was on due to a docking problem. The third attempt was an experience I will never forget. 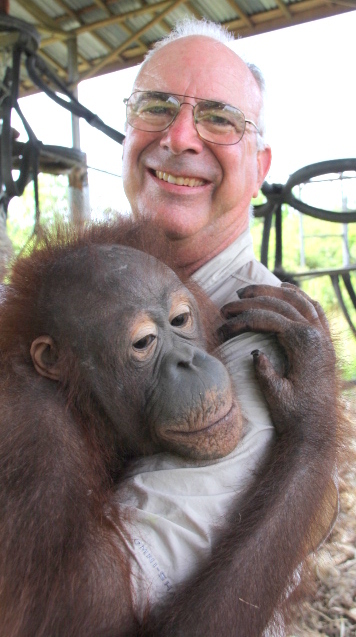 Our first flight from home on a 3-leg journey to Borneo on August 1, 2012 was the beginning of our adventure. The United Airlines jet took off as scheduled and about 20 minutes later, the pilot announced he was returning to our home airport because the air conditioning-cabin pressure was not working. I noticed I was freezing and then all of a sudden I was very hot and my ears were popping constantly. So we landed and all passengers waited in the terminal at the gate for repairs to be made. That’s when the negotiating began between Maureen Taylor, my home-based A+ travel agent with Nexion, Inc., and Nancy Hamrick, an United Airlines Premier Dept. 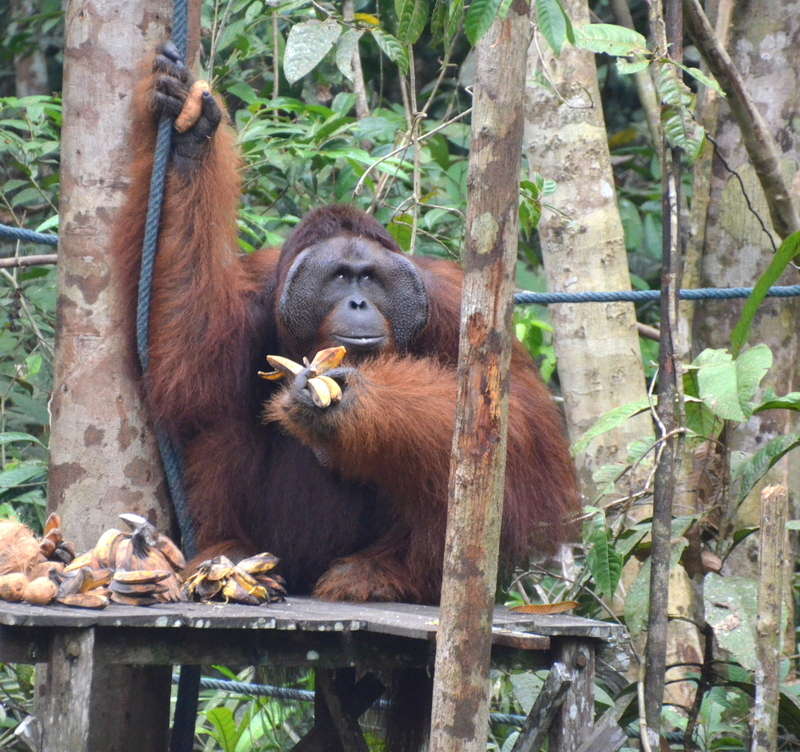 supervisor, because we just had missed our connection out of San Francisco to Seoul, South Korea and on to Kota Kinabalu, Sabah, Malaysia, on the island of Borneo to see those orangutans, one of only 2 places left in the world where they live in the wild. Hunting for 2 seats went back and forth. One minute we were going via Japan to Borneo, and the next minute, we were going via Hong Kong, then Singapore, and then Bangkok. Every possible route was examined for availability. It was like going through a maze trying to find that one open route. And Maureen Taylor was on the case with United Airlines from the minute I called her at 7:30 A.M. as we landed at our home airport. The value of having a travel agent proved priceless again. 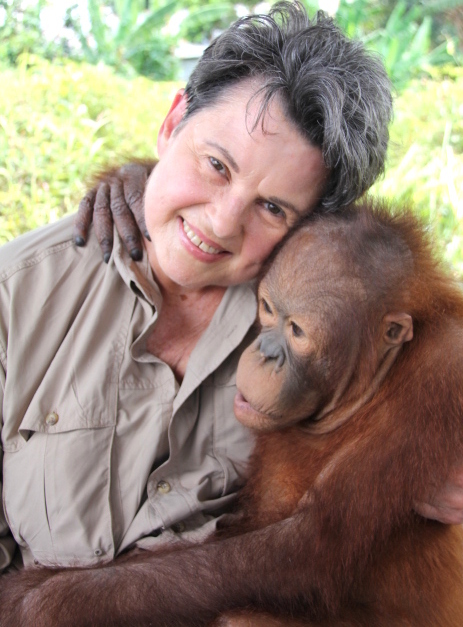 She knew how to work with the airlines, all the routes and how much we wanted to see those orangutans in the wild, plus she knew from experience to build in 2 extra days prior to a trip or cruise. Maureen talked with Nancy at United Airlines for hours. Nancy was beyond super and gave beyond outstanding help and service, trying to come up with an itinerary that would get us into Kota Kinabalu, Sabah, Malaysia, Borneo by 2 p.m. Saturday, August 4, 2012 because we had a ship to catch. 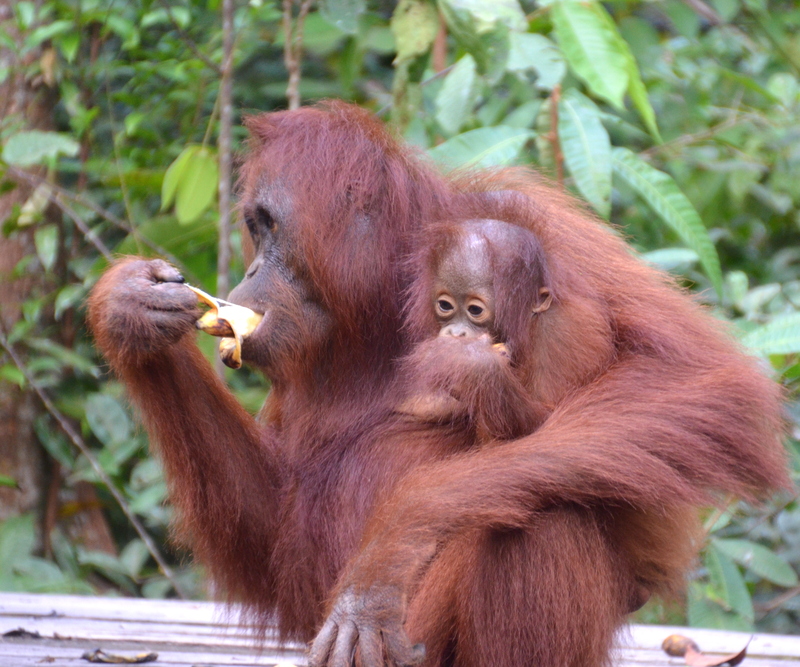 That ship, the Orion II Expedition Cruises out of Australia, was going to take us on a 22-day cruise around Borneo to see those precious orange orangutans in their natural wild habitat in the rainforests of Borneo. But there was a problem. Every United flight was full and every class of service was full that would get us to Borneo by 2 p.m. August 4, 2012. Nancy and Maureen continued the challenge non-stop to find a solution. Somewhere, somehow, both were determined to find 2 open seats any way they could that would get us to Borneo by our deadline. During these discussions, the original plane that had the air-conditioning-air pressure problem was declared repaired and ready to fly to San Francisco. And it was decided by both ladies that our number one goal was to just get to San Francisco, and the 3-hour flying time would give Nancy and Maureen time to find a route with 2 available seats that would meet our deadline from San Francisco. Upon arrival in San Francisco, I called Maureen and she immediately sent us to the international United Airlines gate 100 because 2 seats had been found. “Go straight to Gate 100 immediately and don’t even go to the restroom, just go fast as possible,” Maureen said to me in her desperate sounding voice. And to our shock, the seats were in first class and they were the only seats available that would get us to Borneo in time to meet our Orion II Expedition cruise. But there was another roadblock. It would cost more money to get those first class seats as we were not originally in first class. Nancy and Maureen then went to work on this new problem and a solution was found whereby a certain number of my United Frequent Flyer miles would be used to upgrade us to these 2 available seats. Finally, there was a solution for us to meet that Orion II ship. But wait. Another problem then surfaced. Asiana Airlines, which was originally scheduled to fly us from Seoul, South Korea to Kota Kinabalu, Sabah, Malaysia, Borneo, would not release our seats on their flight. Again, Nancy and Maureen went to work to find a solution to this new roadblock and they found it. A United Airlines supervisor at the San Francisco airport personally walked over to the Asiana Airlines desk at the airport and spoke to an agent about releasing our 2 seats due to United’s mechanical problem. And to our amazement, Asiana Airlines released our seats and United was then able to confirm our 2 seats in United first class to Hong Kong, followed by 2 seats in coach on Malaysia Airlines to Borneo. And they were all in time to board the Orion II cruise. But it was not that easy as another problem then occurred. Tom and I would have to spend the night in Hong Kong because we would arrive there after the one Malaysia airline flight had left for Borneo that day. So Maureen immediately grabbed a hotel room for us in Hong Kong, solving that hiccup, and then learning it was the last room available at the Hong Kong airport hotel. What luck! Still, another problem occurred. We did not have a visa to enter China as we had not planned to go to Hong Kong. After much discussion, it was determined that “in transit” passengers did not need a visa to enter Hong Kong. So we were OK on this problem. But we were not out of the maze yet. The United Airlines gate agent in San Francisco could not help us claim our 2 first class seats because we did not have a boarding pass and she could not provide us one. Maureen and Nancy continued their work on this challenge and soon two United Airlines customer service supervisors arrived at the gate providing boarding passes for us. And then they escorted us onto the plane to our seats at 3H and 3K. What an experience we had just had and we weren’t even there yet. We were scheduled to arrive in Borneo on Aug. 3 and would spend one night in the Hyatt Kota Kinabalu in time to board that Orion II ship. Finally, our emergency re-scheduling had been solved and we were on our way to Borneo. But it was due to Maureen and Nancy, who took the bull by the horns, to personally solve this unforeseeable and almost impossible problem and to get us successfully and safely to Borneo. It was a dream come true and we are forever grateful to these two awesome ladies for never giving up until we were re-routed successfully to our dream destination and those orangutans. Going first class on United Airlines was amazing and our first experience was one of adventure, discovery and just plain luxury and enjoyment. Everything we wanted was provided and we thought we were royalty with the outstanding service. 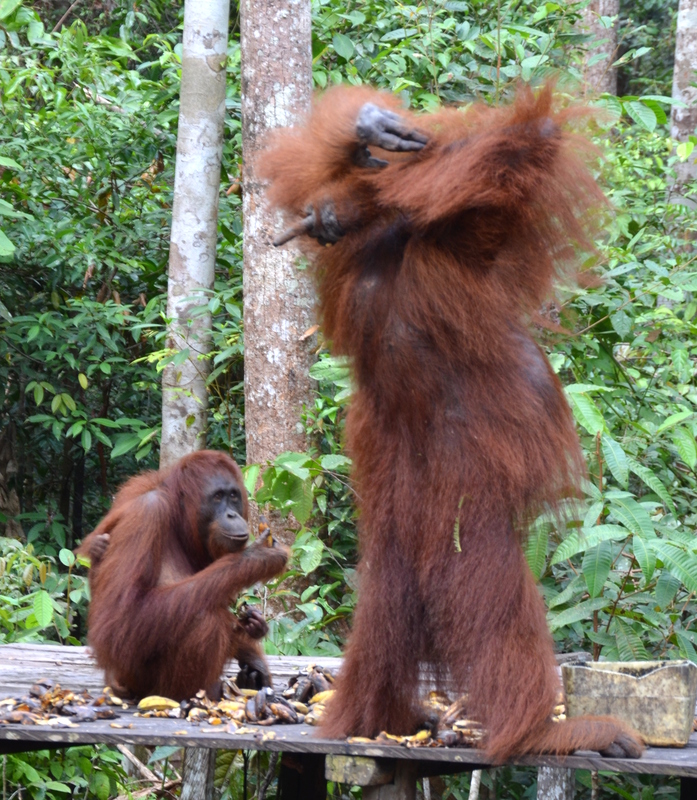 To get us to the orangutans, these two ladies were on the phone working together non-stop to solve the problem for us. Changing an entire itinerary and airline at the last minute was almost impossible and therefore, took time to solve the unbelievable complexities. Beyond Priceless. Finally, when I told this adventure to Kim, an attendant on our Hong Kong flight, she said “You are so calm and cool about it.” I told her I learned long ago to handle a problem remaining calm because you have to be to handle one and it usually turns out good if you do”. Kim also was awesome and fulfilled our every need and wish on that first class flight for us. Priceless. 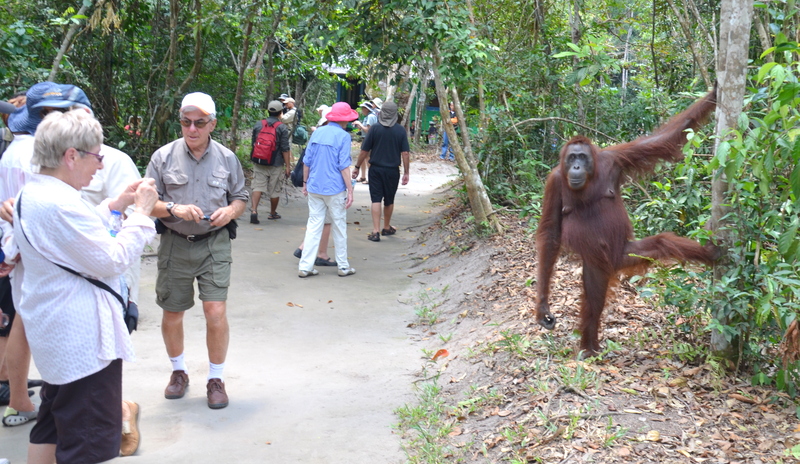 The third time was a charm and an adventure we will never forget because of those orangutans, Maureen Taylor and Nancy, Orion Expedition Cruises and United Airlines. It was a successful impossible dream come true!